While the King of Pop may no longer among us, there is no doubt he will have eternal life in the memory of his fans and the fortunate few who had the chance to meet him in person. One such lucky fan was Badrul Hisham, 46, food and beverage manager of Concorde Hotel Kuala Lumpur. 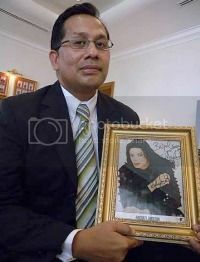 In 1996, when Michael Jackson performed in Malaysia, Badrul was the butler assigned to the star's suite. autographed picture by the star himself before he left. "He was a quiet but beautiful and polite man," recalled Badrul. Based upon his observation during the star's week-long stay, Badrul remembered Jackson for wearing a "Do Not Disturb" sign around his neck and generally spoke very little. The demeanour changed when Badrul's boss, Tan Sri Syed Yusof brought 15 children aged between five and seven to his suite. "He was very happy to see them. He and the children made a mess of the place by spraying silly string all over the place and by popping the hundreds of balloons that we had put in there. You could see that this was a man who loved children," said Badrul. Badrul also confirmed the star's playful nature. "Jackson had a toy police car which he'd push around the suite. He would shoot at balloons with a pop gun. I also remember him sending his staff out to get video tapes of Tom and Jerry and Mickey Mouse," he recalled. The young butler also recalled dealing with an anxious Michael who got a stomach ache after consuming some tandoori chicken. "But he liked it so much that he ate it again for several days," said Badrul who revealed that the star also liked ice-cream and M&Ms. When it was time for the star to depart, Jackson personally gave Badrul an autographed picture of himself as a sign of appreciation. 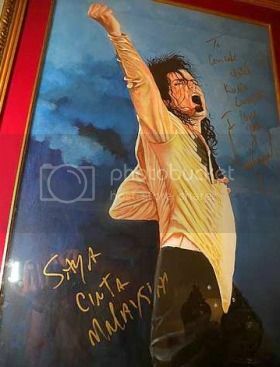 While Jackson may have come across as 'childlike' to many, Syed Yusof, the man responsible for bringing the King of Pop to Malaysia said that Jackson was a true professional and a perfectionist. "He was always very concerned about his fans. On the first day, when we went to Toys 'R' Us to buy presents for the children of Rumah Ozanam, I was concerned by the crowed that had gathered there and suggested tat we cancel that outing. But Michael insisted on going because he didn't want to disappoint his fans," said Yusof. Yusof, who described the late star as 'energetic', recalled how worried he had been when Jackson called him up one night because he couldn't sleep. But, he waved aside notions of Jackson as a difficult person. "One example was when one of the children I brought asked him about his nose. He didn't get offended at all," he said. The demise of pop's living legend came as a shock to Yusof as his brother, Jermaine told him that 'Michael was doing very well' only a month ago. Imuda, best captures Jackson's on-stage persona. It was a sad day for him when a friend SMSed to announce that the star had passed away. "Michael was a warm and caring person and this showed in the way he used the word 'love' so often in his speech. All those negative rumours about him are all lies," said Yusof. Syed Yusof Wafa, 38, can attest to this. 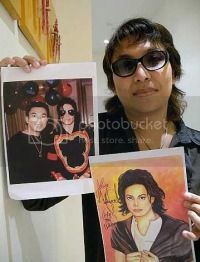 He had spend 25 minutes in the King of Pop's suite when he presented him with a collection of celebrity drawings. "He greeted me warmly and told me that he loved art and drawing. He also admired the locket I was wearing at that time," remembers Wafa of his meeting with the star in 1996. Nadarajan R. Govindan, 41, an MJ impersonator who won the Malaysian Michael Jackson Competition in 1993, remembered camping in front of the hotel for two days to catch a glimpse of his favourite performer. Though Nadarajan did not get to meet Jackson, he reacted very emotionally on hearing the news. The father of five, who started impersonating Jackson in 1980, said that the world will mourn the passing of a great legend. I discovered your blog the use of msn. I'll be sure to bookmark it and return to read extra of your helpful information.